Viewers are thrown into the deep end of the pool from the get-go with writer / director Bruno Gascon’s film “Carga.” Gascon’s movie, suitably bleak and dreary, focuses on a human-trafficking network and a few of the people caught within it (both victims and perpetrators). The key players are introduced within the opening scene – truck driver António (Vítor Norte), network leader Viktor (Dmitry Bogomolov), and victim Viktoriya (Michalina Olszanska, who also plays Viktor’s sister, and right-hand woman, Alanna). António stops on the side of a highway so Viktor and his men can unload the passengers, illegal immigrants hidden among the contents of António’s trailer with the assumption of safe passage into Portugal, into a large van. One of the passengers loaded into the van is Viktoriya, whose dialogue-less initial scenes require actress Olszanska to establish a connection with the audience solely via facial expressions. It is clear that António is uncomfortable with the situation, though it’s not clear how long this discomfort has been around. Was he once ok with what he was participating in? Or has he, in some way, been forced into being an unwilling accomplice? Sensing his discomfort, Viktor later calls António, threatening to harm his wife and granddaughter if he quits. There isn’t much given in the way of backstory for any of these characters and none have any sort of character growth within the film. Viktoriya is the helpless victim with a strong survival instinct, Viktor is the evil boss, and António is the hapless old man caught in a spider’s web. One of the points director Gascon seems to be trying to make with “Carga” is that anyone could find themselves, a title card at the end of the film proclaims “it could be you,” in this situation. 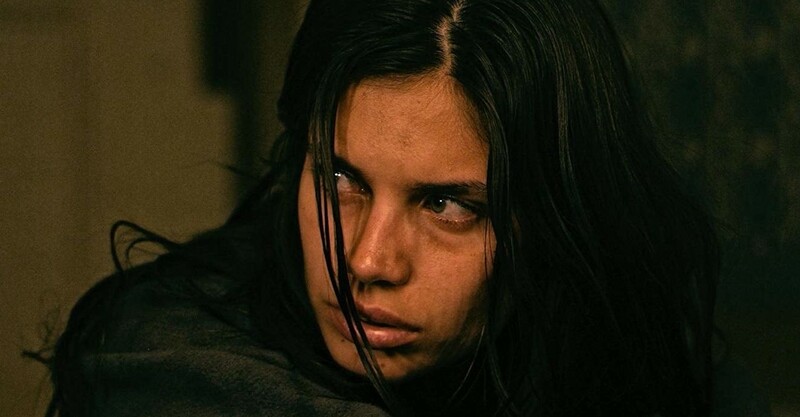 Michalina Olszanska, whose dual characters are on opposite ends of this trafficking network, visibly serves to represent that idea to the audience. Her performance is one of the film’s strengths, she so fully disappears into her roles that I didn’t realize the same actress was playing both women until the movie was over. “Carga” constantly shifts its focus between multiple characters, another way in which Gascon drives home the idea of “it could be you.” You don’t necessarily have to be the victim to be involved in this crime. Viktoriya finds herself locked in a cold, run-down building along with the other women kidnapped by the traffickers. All of the men that were in the truck are shot dead in the courtyard, an act which Viktor makes sure happens in plain sight of the women. When they come to take away a young girl, who Viktoriya has been comforting, Viktoria is the only one to put up a fight for her. After the men have gone, she reprimands the other women for not putting up any sort of fight. Technically, the film is well made. It’s well shot, one of the few things I liked about it. “Carga” takes on a blue hue with its photography, embellishing the hopelessness of Viktoriya’s situation while also further establishing the depressing mood of the movie. At times, the subtitles disappear into bright backgrounds, making them initially unnoticeable then, once their presence is noted, very difficult to read. This is something that really should have been noticed by the filmmakers before its release. As previously stated, the actors do a great job at portraying their characters. Yet, their performances don’t help to sell the movie. Despite grasping her dire predicament, it was hard to empathize with Viktoriya. Gascon’s attempts at connecting the viewers with the traffickers also felt odd. António is the most engaging of the characters but the lack of information leaves you wondering whether or not you should care about the man. “Carga” plods along aloofly to its conclusion, which goes in an expected direction once certain events start unfolding. Maybe a stronger final act would have helped the movie out, but I felt done with it far before it got to that point. “Carga” is a harsh and brutal film, though maybe not as hard to watch as you’d think considering the subject matter.